Specially designed for Sony Ericsson users, 4Easysoft Mac Sony Ericsson AMR Converter aims at converting various video, audio, HD video to AMR, MP3 on Mac, such as MPEG, VOB, DAT, MP4, M4V, TS, RM, RMVB, WMV, HD TS, HD MTS, HD MPEG, HD MP4, HD WMV, WAV, WMA, M4A, RM etc. In order to achieve the best audio quality, 4Easysoft Mac Sony Ericsson AMR Converter assists you to edit audio length, set output audio parameters, merge files, add watermark in your own way, etc. 4Easysoft Mac Sony Ericsson AMR Converter aims at converting video/HD video/audio like MPEG, VOB, DAT, MP4, M4V, TS, RM, RMVB, WMV, HD TS, HD MTS, HD MPEG, HD MP4, HD WMV, WAV, WMA, M4A, RM etc to AMR, MP3 on Mac for Sony Ericsson users. Use Trim button to specify the exact start and end time or just move slider bars to select the converting part. Set audio output parameters by modifying Encoder, Channels, Bitrate and Sample Rate. Click Save as… to reserve all parameters for your latter use. Join selected contents to one file so as to bring you convenience. The watermark function supports the process of adding Text or Image watermark for your video. With this you can adjust the size of your pictures, texts and so on. 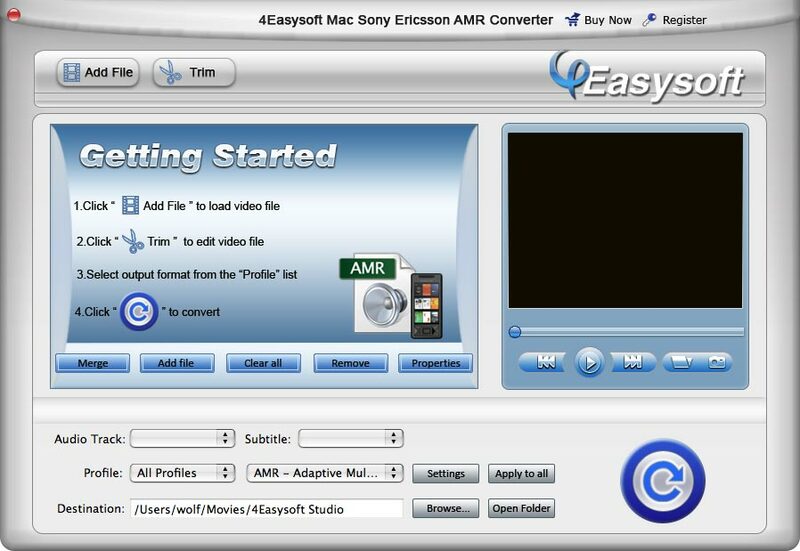 Choose subtitle and audio track or none of them for your output file with this 4Easysoft Mac Sony Ericsson AMR Converter. 4Easysoft Mac Sony Ericsson AMR Converter supports watch the input video effect in advance. Meanwhile, you can click Snapshot to reserve favourite pictures in default folder automatically. With super conversion speed and high quality, 4Easysoft Mac Sony Ericsson AMR Converter brings you the most convenient and enjoyable conversion process. It is available for you to add your favorite watermark for your video to meet your personal need. Choose subtitle and audio track according to your own prefer.